Group Discussion Ideas > Political GD Topics > Is ‘Jan Dhan Yojana’ a success? 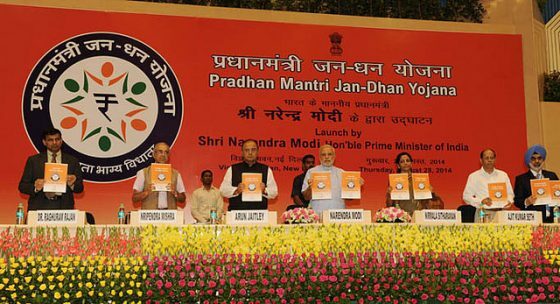 Is ‘Jan Dhan Yojana’ a success? It is a financial inclusion scheme aimed particularly at the poor and the needy, i.e. it aims at connecting them to the existing banking system. It was launched in 2014. This Scheme also aims to improve access to banking amenities such as ATM transactions, overdraft facility, short-term credit, and insurance, etc. It created the Guinness World Record in 2014 by opening the highest number of bank accounts in a single day. By August 2017, 295.2 Million accounts have been opened. This led to deposits of over Rs. 658.45 Billion (~half percent of the GDP of India). Evidence says that the accounts are increasingly being used actively. Under PMJDY, people will be able to open zero-balance accounts with any bank, private or public. The only proof required is the Aadhar. Those without it can also use NREGA and voter id cards. There are provisions for even those who don’t have these. Accident insurance of one year up to Rs. 1 lakh was given to those who opened bank accounts in a specified period. Additionally, life cover of Rs. 30,000 was also given. All holders will get a RuPay card and basic mobile banking. The government plans to reimburse all the costs of the banks. Only 54% Indians had access to banking services. Most of these depend on local moneylenders for credit. It will be easier for the government to directly pay the subsidies, thereby, preventing the leakage. Easy access to banking can bring economic prosperity to the nation. This is a scheme which showed us that the rural people learn by using as is evident from the fact that, aided by government direct benefit transfer, the people increasingly actively used their accounts. This also may lead to a shift of the workers from the informal to the formal economy. Women and other backward classes enjoyed greater account ownership after the PMJDY. This will also lead to the ultimate faltering of myths like distrust in the financial system and will eventually decrease the distance to the nearest bank branch. NPC hasn’t been able to serve even the last-minute calls of life insurances. In that case, government, as it has always done, will go to LIC. Will the banks be interested to provide equal services to the zero-balance account holders? If the government will pay all the costs to the banks, it will be just another scheme financed by the taxpayer’s money. The main problem is whether these accounts will just lie dormant? There is another problem of account duplication, which can dodge the ultimate government objective of direct benefit transfer and remove the duplicates in the system (The only document that can verify whether there are duplicate accounts is the Aadhaar which is not mandatory and has its own problems if made mandatory). Therefore, even if there is a huge increase in a number of accounts, it doesn’t translate to that the very needy have opened accounts. There are wide discrepancies between the data on active usage according to the regions and states, which exposes the doubts regarding policy communication. As goes with the demonetization process, there are questions as to how much trust we can put into our banking system? There were headlines as to how the banking personnel refused to create accounts on absurd bases. The numbers should not be translated to 100% household coverage because of these ambiguous statements equal to those who have still not been financially included (the poorest and the neediest) being treated as invisible. The financial problem of the country will not be improved unless successive governments take steps against the big NPA problem. There needs to be strict monitoring of the indicators both by the governmental and non-governmental organizations to clearly calculate the reach of the program and its nature. The awareness regarding the banking system needs to instill in both the prospective rural customers as well as the staff. Otherwise, such schemes will not be implemented but thrust onto the face of the banking system. Policymakers need to determine what causes the banking staff to behave rudely with the rural populace.